Looking for interesting people to follow or posts on your favorite topic? Check out the Search Google+ box on the top of the page. Here's what you'll see when you enter a keyword in the search box. You'll notice the search results has a separate tab for people, posts, and sparks and a tab which shows a consolidated version of all three (labeled as everything). You'll also notice the Best of/Most Recent links on the tabs labeled Everything, Google+ posts and Sparks. Best of shows the most relevant results and Most recent shows the recently posted updates. You can click on 'Save this search' if it's a topic you would like to revisit on a regular basis. For example, I've saved searches for art keywords so I can keep track of new paintings and sketches posted on Google+. Clicking on 'Save this Search' button saves a link to the search just below the list of your circles on your left-hand sidebar. 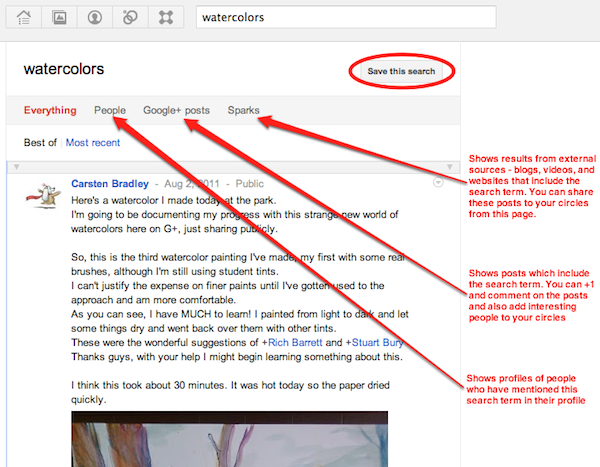 More info on search in the Google+ Help Center.